Panditji said to Dasharath that people were discussing his widow plan, and wanted to give charity. Dasharath said it could not be possible without him at all, and thanked him. Dadi bua said if the fruits would be given to charity. Pandit showed the jewelry and said it was the real gift. Dadi bua said she would go and do her puja. Dasharath said he would calculate that and said bye to them. Once she went, Dasharath wore the jewelry and said she has snatched his everything in two days, but the real test was still on. Dhaani asked Kaka to do the other work and said she would do the work. Viplav came and asked, so she was working. Dhaani said she would make preparations all night. Viplav was surprised. He said did she think he would let her work all night. Dhani said, but she had work. Dhaani asked him to go. Viplav looked on. He called Ramdeen and asked him about the flower arrangements. He took out the flower garland, and it fell on them. They fall with flowers on them.Viplav and Dhaani smiled. Dhani said how to come out of those flowers. Viplav said she was trapped with him and laughed. Masterji asked why did she not go to a school that day. Masterji asked her to come if she wanted to learn something from the heart. Later Viplav was in his room and thought about his doubt on Dhaani. 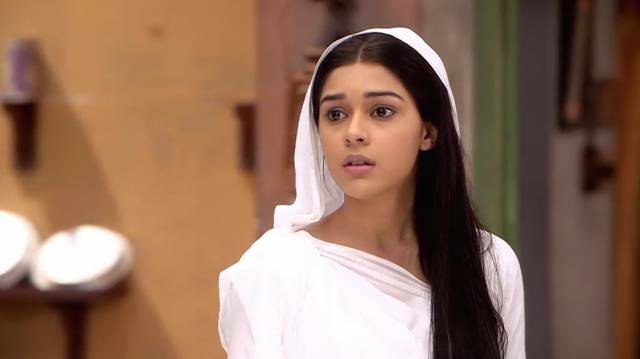 Dhaani came to the room, wore a shawl and thought that was good that Viplav went with his friends. She kept a pillow on the bed and covered with a blanket before switching off the lights. Viplav was in the room and heard her. Dhaani went. Viplav followed her on the road and called her. Dhani got tensed but picked the call. Viplav asked where she was. Was she at home. Dhaani said yes. Viplav said he would come late. Dhaani felt something was wrong and thought to go back home. She then thought about Masterji’s words and walked on. Kamini thought where Viplav was. If he did not come then, her plan would get ruined. Dhaani got a call from Ashram, and she disconnected the call. Viplav continued to follow Dhaani. Dhani said someone was following her, and she was feeling strange. Kamini asked her not to return and have strength. She asked her to go to school and not to get scared. She cut the call and waited anxiously for Viplav. Dhaani was still working on the road. A car stopped on the road. Viplav missed her. Dhaani reached bahar gali. A prostitute stopped Viplav. Viplav missed Dhaani again. Dhaani reached night school and told Masterji that she had come. She sat on the bench. Masterji said he would teach her how to write names. Two of the students(prostitutes) fight with each other. He asked them to sit quietly and sit down. Masterji wrote Viplav’s name in Hindi. Dhaani wrote in her book Viplav. Dhaani showed paper. It blew by air and fell on Viplav’s face, who was just standing outside the night school. Viplav threw the paper without seeing that and went. Dhaani came out and picked the paper and looked happy. Stay tuned to The Reporter Times for latest Ishq Ka Rang Safed news and updates.